MUMBAI, March 13 (Reuters) - India soybean futures may open higher on Friday tracking firm Malaysian palm oil prices, analysts said. At 9:27 a.m., benchmark May palm oil KPOc3 on the Bursa Malaysia Derivatives Exchange was at 1,952 ringgit a tonne, up 1.67 percent. April soybean NSBJ9 on the National Commodity and Derivatives Exchange ended down 0.65 percent at 2,297.5 rupees per 100 kg on Thursday. March 13 (Bloomberg) -- Crude oil traded near $47 a barrel in New York, after posting the biggest gain in three weeks yesterday, as OPEC prepares to meet this weekend to consider a fourth production reduction. The global oil market is oversupplied and OPEC will cut output if needed, Shokri Ghanem, who chairs Libya’s state-run National Oil Corp., said yesterday. Other ministers have called for the group to halt reductions. Crude oil for April delivery fell 38 cents to $46.65 a barrel at 9:59 a.m. Sydney time on the New York Mercantile Exchange. Yesterday, futures rose $4.70, or 11 percent, to settle $47.03 a barrel, the biggest gain since Feb. 19. Prices are up 5.4 percent so far this year. Futures had dropped 7.4 percent on March 11 after a U.S. government report showed a bigger-than-expected inventory gain. Daily crude-oil price swings are widening. Futures fell or rose by 4 percent or more on 24 trading days since the beginning of the year, compared with three days in the same period last year, according to data complied by Bloomberg. Oil also gained yesterday as U.S. equities rose for a third day. Stocks were buoyed as General Electric Co. said the loss of its top credit rating at Standard & Poor’s won’t hurt business, and Bank of America Corp. said it was profitable in January and February. The S&P 500 Index increased 4.1 percent to 750.74. OPEC has reduced daily output targets by 4.2 million barrels since September. Ministers will meet in Vienna on March 15 to discuss whether to make further cuts. Nigeria is opposed to further oil supply reductions by OPEC countries at this month’s meeting, a spokesman for the state oil company said yesterday. Qatari Oil Minister Abdullah bin Hamad al-Attiyah said earlier this week that the group needs to reach full compliance before any new action. The 11 OPEC members with quotas, all except Iraq, produced 25.39 million barrels a day in February, down from 29.22 million barrels a day in September, according to a Bloomberg News survey of oil companies, producers and analysts. The group agreed to pump 24.845 million barrels a day starting Jan. 1. Oil prices have touched their lowest point for the year and are set to rebound above $60 a barrel because of resilient demand and OPEC cuts, a Standard Chartered Plc trader said. The direction oil prices take will depend more on a meeting of world leaders in London on April 2 than on what OPEC decides this weekend, Daniel Yergin, chairman of Cambridge Energy Research Associates, said in an interview this week at the Futures Industry Association annual conference in Boca Raton, Florida. Brent crude oil for April settlement increased $3.69, or 8.9 percent, to end the session at $45.09 a barrel on London’s ICE Futures Europe exchange yesterday. The price of oil on the Nymex for delivery in May is 87 cents higher than for April, compared with a premium of 94 cents a barrel yesterday and down from a $2.66 premium March 11. December futures are $5.95 higher than the front month. The narrowing of the spread between the contracts has coincided with falling inventories at Cushing. March 13 (Bloomberg) -- The yen rose against the dollar, heading for its first weekly gain since January, and advanced versus the euro on speculation Japanese companies are bringing back earnings on overseas assets before the financial year-end. The yen rose against 15 of the 16 most-active currencies on prospects Japanese exporters and investors are taking advantage of the currency’s decline to a two-month low versus the euro to repatriate funds. The euro traded near a three-week high against the dollar after European Central Bank council member Yves Mersch said he doesn’t see deflation risks in the region, tempering speculation the ECB will cut interest rates. The yen rose to 97.30 per dollar as of 9:26 a.m. in Tokyo, from 97.72 late in New York yesterday. The Japanese currency climbed to 125.58 per euro from 126.16, after dropping to 126.39 yesterday, the lowest since Jan. 8. The dollar was little changed at $1.2919 per euro from $1.2913. FKLI March futures contract plunge another 12 point lower to close at 835 as compare to previous trading session with total 7278 lots traded in the market. FKLI continue to plunge despite positive stimulus package announce been announce by our Finance Minister in previous days. 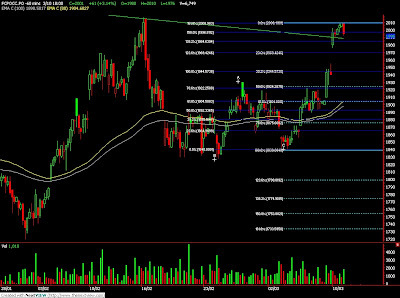 Technically, FKLI yesterday seems closed on 161.8% Fibonacci projection levels at 835 regions. 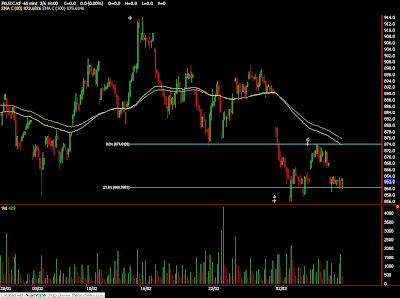 We expect FKLI might rebound in the coming trading session provided support levels at 830 and 803 were not violated. However, traders were still advice to hold short position in the coming trading session while be cautious around resistance levels at 852 and 874 regions. FCPO 3rd month May Futures contract plunge RM60 lower to close at RM1920 as compare to previous trading session with 7942 lots traded in the market. CPO price was trading south as soon as Dorab Mistry market reviews regarding CPO price being release during the 2nd trading session. Technically, CPO price was trading downwards throughout the entire trading session and stopped at 61.8% Fibonacci retracement level at RM1910 regions. We expect CPO price would still intact with bull trend provided support level at RM1910 and RM1880 were not violated. Traders were still advice to hold long position for CPO price trading in the coming trading session while be cautious around resistance levels at RM1960 and RM2000 regions. March 12 (Bloomberg) -- The yen and the dollar rose against the euro on speculation the deepening global recession will increase demand for the currencies as a refuge. The yen and the dollar also strengthened versus the Australian and New Zealand dollars as stock markets snapped two days of gains, reducing the allure of higher-yielding currencies. The euro fell for the first time in three days against the greenback before a German report that economists say will show industrial production dropped for a fifth month, giving the European Central Bank more scope to cut interest rates. “The market is troubled by the lack of follow-through in equity markets and it has held the risk rally back,” said Henrik Gullberg, a currency strategist at Deutsche Bank AG in London. The yen appreciated to 122.41 versus the euro as of 9:20 a.m. in London, from 124.86 yesterday in New York. The dollar strengthened to $1.2769 per euro, from $1.2837. The Japanese currency advanced to 95.68 per dollar, from 97.27. It may rise to 94 per dollar this week, then fall to 100 in the next couple of months, Gullberg said. The yen climbed 3 percent to 61.56 against the Australian dollar and rose 2.3 percent to 48.77 versus the New Zealand currency. The yen gained versus all 16 of the most-traded currencies after the Cabinet Office said Japan’s gross domestic product shrank an annualized 12.1 percent last quarter, the fastest pace since 1974, and the MSCI World Index of stocks fell 0.6 percent. The market is trading on the assumption that U.S. and Japanese investors are stepping up repatriation of funds when risk aversion increases, bolstering the domestic currencies at the expense of higher-yielding currencies such as the Australian and New Zealand dollars, Gullberg said. The dollar may weaken to 95 yen and $1.33 per euro as momentum charts show “sell” signals for the greenback, according to Bank of Tokyo-Mitsubishi UFJ Ltd. in Tokyo. The U.S. currency may extend losses to that level, a 38.2 percent Fibonacci retracement of its rally to the March 5 high of 99.68 from the January low of 87.13, said Osamu Takashima, chief foreign-exchange analyst in Tokyo at Bank of Tokyo-Mitsubishi. Fibonacci analysis also indicates the dollar will drop to $1.33 per euro, Takashima wrote in a research note today. New Zealand’s dollar snapped two days of gains versus the yen after the central bank cut its benchmark rate by half a percentage point to 3 percent, weakening the appeal of the currency. New Zealand’s policy rate compares with 0.1 percent in Japan and a 3.25 percent in Australia. The euro fell for a second day against the yen on speculation a German report today will show industrial output declined in January. The European Central Bank still has “room to move” after reducing the benchmark interest rate to 1.5 percent on March 5, ECB council member Erkki Liikanen said yesterday in Helsinki. “Additional rate cuts by the ECB and weaker euro-region economic data could trigger the euro-yen to head lower,” said Masafumi Yamamoto, head of foreign-exchange strategy for Japan at Royal Bank of Scotland Group Plc in Tokyo and a former Bank of Japan currency trader. The yen will rise to 120 per euro in coming months, he said. Industrial output in Germany fell a seasonally adjusted 3 percent in January from the previous month, according to a Bloomberg News survey of economists. The figures will be released at noon in Berlin. Losses in the dollar against the yen may be limited on speculation U.S. investors will bring back earnings from overseas assets because of concern the global recession will worsen. Sales at U.S. retailers dropped 0.5 percent in February, the seventh decline in eight months, a separate Bloomberg survey of economists showed before the Commerce Department report today. “Retail sales are likely to signal a further deterioration of the U.S. economy, which may spark renewed repatriation of the dollar by U.S. investors,” said Takashi Matsumura, a Tokyo-based economist at Mizuho Research Institute, a unit of Japan’s second- largest banking group. The Dollar Index, which the ICE uses to track the greenback’s performance against the currencies of six major U.S. trading partners, was little changed at 87.870. The index touched 89.624 on March 4, the highest level since April 2006. KUALA LUMPUR, March 12 (Reuters) - Malaysian crude palm oil futures may fall back to 1,500 ringgit, felled by slow demand and lower crude oil prices, a top industry analyst said on Thursday. "We would be set for a soft landing, with BMD futures settling in the 1,400-1,500 ringgit range, that is on trend," James Fry, chairman of commodities consultancy LMC International, said. NEW YORK/LONDON (Reuters) - Gold bounced above $900 an ounce on Wednesday as bargain hunters entered the market after a stock market rally fizzled because of scant details about plans to support the U.S. banking system. Spot gold was at $909.85 an ounce at 2:27 p.m. EDT, up 1.5 percent from its last quote $895.80 late in New York on Tuesday. U.S. gold futures for April delivery settled up $14.80, or 1.7 percent, at $910.70 an ounce on the COMEX division of the New York Mercantile Exchange. Stock markets took heart after U.S. Treasury Secretary Timothy Geithner said he would move quickly to establish details about a plan to mop up banks' toxic assets. "Gold has risen as the rally in U.S. equities peters out," said David Thurtell, analyst at Citigroup. "Some investors undoubtedly see prices below $900 an ounce as cheap." Financial market turbulence and instability have seen many investors pile into gold-backed exchange traded funds in recent months, but data shows it may have tailed off. Holdings of the SPDR Gold Trust, the world's biggest gold ETF, were unchanged at 1,028.99 tonnes on Tuesday. SPDR's holdings have increased by less than five tonnes in the last three weeks, compared to around 200 tonnes in the first six weeks of 2009. Falling demand for gold jewelry is also expected to cap prices, analysts said. Jewelry buying -- a major source of gold demand -- has been sluggish with prices near $900, especially in India. Supply of gold scrap from Turkey, the Middle East and Asia is rising. In other supply news, the World Gold Council said signatories to the Central Bank Gold Agreement -- which include a number of European central banks and the IMF -- have sold only 80 tonnes of gold since the pact entered its fifth year in late September. Under the terms of the agreement, the banks can sell up to 500 tonnes of gold per year. "Unless the pace of official sector sales increases significantly, the CBGA will undershoot the 500-tonne quota by an even wider margin than it did last year," said HSBC analyst James Steel. "Reduced central bank sales are among the most notable bullish factors in the market," he said. Richard O'Brien, CEO of the world's No. 2 gold producer Newmont Mining Corp (NEM.N), told the Reuters Global Mining and Steel Summit in New York that he will be surprised to see gold on average below $900 this year. Spot platinum was at $1,049.50 an ounce, up 1 percent from its previous close of $1,039.50 on Tuesday. The metal, primarily bought by industrial users, has suffered from expectations a recession will weigh heavily on demand. Spot palladium traded at $196.00 an ounce, up 0.3 percent from its late Tuesday New York quote of $195.50, while spot silver was at $12.79 an ounce, up 1.8 percent from its Tuesday finish of $12.57. KUALA LUMPUR, March 12 (Reuters) - Malaysian palm oil futures may come under pressure in the second half of 2009 on weaker soyoil prices as well as an uptick in output from August and slower shipments, a top industry analyst said on Thursday. But for the moment, palm prices could cross 2,000 ringgit ($541.4) per tonne and test the 2,100 ringgit level in the next few weeks as stock levels fall in top producers Malaysia and Indonesia, said Dorab Mistry, whose views are closely followed by the market. "I am estimating from August onwards, we shall see a very good uptick in crude palm oil production. That is why I am afraid my prognosis is that palm oil futures will only get to 2,100 ringgit at best," Mistry told a palm industry meeting in the Malaysian capital. "For the second half of the year, I expect palm oil prices to come under pressure from soyoil and also from bigger production and weaker demand." Traders normally expect a seasonal uptick in production by September and stocks are largely seen to swell again. Mistry, head of vegetable oils trading with Indian conglomerate Godrej, said the price of palm oil had done well in recent months due to strong exports but this had eroded its competitive advantage over rival soyoil. "I fully expect the price of RBD palm olein to come very close and temporarily to exceed the price of crude degummed soyoil," he said. "Beyond April and May, palm will become uncompetitive against South American soy oil and will lose market share. Palm is doing so well on exports that palm will need to push demand away towards soy oil and that will be done by price." Crude palm oil futures KPOc1 have jumped 23 percent since January, while U.S. soyoil BOc1 is down 7 percent, narrowing the spread between the two contracts to below $150 a tonne, one-third the recent peak spread of last August. In Europe, palm oil is trading at a 9 percent premium to soy oil, reversing the 2.5 percent discount of early January. Although most vegetable oil consumption, including palm oil, could weaken around the world, India's demand would increase, thanks to zero duties for crude palm and sunflower oil, and low import duties for other soft oils, such as soyoil. "Indian consumption will expand by half-a-million tonnes," Mistry said. "Import duty on palm products is unlikely to be imposed or increased until a new government is in office and that means not until the end of June." India, the second largest vegetable oil importer, goes to the polls in April and May. The South Asian country imports roughly half of the vegetable oils it consumes annually. It buys refined palm oil from Malaysia and crude palm oil from Indonesia as well as soyoil from Brazil and Argentina. Total Indian consumption will stand at 13.5 million tonnes in the oil marketing year starting in November, up from 13 million in the last oil year. March 12 (Bloomberg) -- Crude oil traded near $43 a barrel in New York after falling 7.4 percent yesterday as a U.S. government report showed a bigger-than-expected inventory gain and a drop in fuel consumption to a two-month low. Supplies increased 749,000 barrels to 351.3 million barrels last week, the Energy Department said yesterday. Stockpiles were forecast to rise by 250,000 barrels, according to the median of analyst estimates in a Bloomberg News survey. Refineries ran at 82.7 percent of capacity, down from 85 percent a year earlier, as demand slipped. Crude oil for April delivery rose 47 cents to $42.80 a barrel at 9:37 a.m. Sydney time on the New York Mercantile Exchange. Yesterday, April futures fell $3.38 to settle at $42.33 a barrel, the lowest since March 3. Prices are down 5.1 percent so far this year. U.S. fuel consumption dropped 3.5 percent last week to 18.9 million barrels a day, the lowest since the week ended Jan. 9. Total daily fuel demand averaged over the past four weeks was 19.3 million barrels, down 2.1 percent from a year earlier. World oil use will average 84.27 million barrels a day this year, a drop of 1.38 million barrels from 2008, the department said in a report earlier this week. Gasoline inventories declined 2.99 million barrels to 212.5 million barrels in the week ended March 6, the department said. Stockpiles were forecast to fall by 1 million barrels, according to the median of analyst estimates in the Bloomberg survey. Distillate stockpiles rose 2.1 million barrels to 145.4 million, the report showed. A 200,000-barrel increase was forecast. China, the world’s second-biggest energy consumer, cut net crude-oil imports to the lowest in at least two years in February, according to data released by the customs bureau in Beijing yesterday. Net shipments dropped for a second month to 11.12 million metric tons, about 2.9 million barrels a day, as imports fell the most since at least 2006. German manufacturing orders collapsed in January as the recession cut exports. Orders plunged 38 percent from a year earlier, the biggest drop since data for a reunified Germany started in 1991, the Economy Ministry in Berlin said yesterday. Russia exported oil at a higher rate than the 2008 average during the two months after the Organization of Petroleum Exporting Countries’ December decision to curb supply, according to Russian Energy Ministry CDU TEK statistics. Deputy Prime Minister Igor Sechin told journalists at OPEC’s Dec. 17 meeting in Oran, Algeria, that Russian exports may fall by as much as 320,000 barrels a day in 2009, should prices remain low. OPEC has reduced daily production targets by 4.2 million barrels since September. Ministers will meet in Vienna on March 15 to discuss whether to make further cuts. Algerian Energy Minister Chakib Khelil said the group is likely to reduce output again at this weekend’s meeting. Algeria’s call for further cuts differs from the view of Qatari Oil Minister Abdullah bin Hamad al-Attiyah, who said in an interview in Doha this week that “we cannot discuss another cut until we see the compliance at 100 percent,” for previous pledged reductions. U.S. Energy Secretary Steven Chu said he’ll caution OPEC ministers about higher oil prices when he talks with them before their next meeting. “If the cost of petroleum increases, that will create a huge strain on the ability of the world’s economy to recover,” Chu said after testifying at a Senate hearing in Washington yesterday. March 11 (Bloomberg) -- Corn fell for the first time in four sessions and soybeans declined after the U.S. government cut its global demand forecasts and raised inventory projections. World corn reserves before this year’s harvest in the Northern Hemisphere will reach 144.62 million metric tons, up 5.8 percent from a February estimate and higher than 129.96 million tons a year earlier, the Department of Agriculture said in a report. Global soybean inventories on Sept. 30 will be 49.95 million tons, up from 49.87 million forecast in February as consumption falls 1.7 percent, the USDA said. Corn futures for May delivery fell 11 cents, or 2.9 percent, to $3.645 a bushel on the Chicago Board of Trade, the steepest decline for a most-active contract since Feb. 27. The price had gained 4.7 percent in the previous three sessions. Before today, futures had dropped 53 percent since reaching a record $7.9925 on June 27. Soybean futures for May delivery fell 15 cents, or 1.7 percent, to $8.62 a bushel in Chicago, after earlier rising 1.4 percent. Before today, the most-active contract had dropped 46 percent from a record $16.3675 in July, touching an 11-week low of $8.3825 on March 2. Demand for grain and oilseeds to feed livestock, poultry and dairy cows will fall as the global recession reduces consumer demand, said Gregg Hunt, a market analyst for Fox Investments in Chicago. World consumption of grain to feed animals, excluding rice and wheat, will fall 1.7 percent to 642.5 million metric tons in the marketing year that began Oct. 1, the USDA said. That would be the biggest percentage drop in 13 years, USDA data show. Global consumption of soybeans to make animal feed and vegetable oil will fall 3.1 percent to 195.3 million tons, the first drop in five years, the USDA said. Demand from U.S. wheat millers to produce flour will fall 2.6 percent to 925 million bushels in the marketing year that ends May 31, the lowest in three years, the government said. Corn is the biggest U.S. crop, valued at $47.4 billion in 2008, with soybeans in second place at $27.4 million, government figures show. The U.S. is the world’s biggest corn and soybean grower and exporter. March 12 (Bloomberg) -- The dollar and the yen gained on speculation declines in Asian stocks boosted demand for the safety of the two currencies. The U.S. currency rose to $1.2811 per euro as of 9:13 a.m. in Tokyo, from $1.2837 late yesterday in New York. The yen advanced to 124.40 per euro from 124.86. The dollar traded at 97.09 from 97.27 late yesterday. The yen strengthened against all 16 of the most-traded currencies as Japan’s Nikkei 225 Stock Average dropped 0.8 percent and the MSCI Asia Pacific index of regional shares lost 0.3 percent. FKLI March futures contract plunge 14 point lower to close at 847 as compare to previous trading session with total 7769 lots traded in the market. FKLI plunge despite opened 10 points higher due to Dow Jones overnight strong closing. Technically, FKLI seems rebound almost 100% at 871 regions and manage to rest on 278.6% Fibonacci projection figures at 846.5 regions. 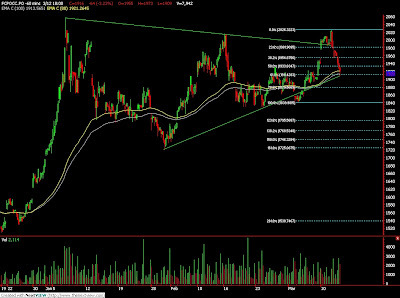 We expect FKLI might rebound slightly higher in the coming trading session where resistances seen at 854 and 860 regions. Traders were advice to continue hold short position in the coming trading session while be cautious around support levels at 830 and 803 regions. FCPO 3rd month May Futures contract retrace mildly RM15 lower to close at RM1980 as compare to previous trading session with 7427 lots traded in the market. It was a wild trading session for CPO price trading as market try to react on favorable monthly MPOB report while crude oil and soybean oil electronic was less encouraging. Technically, CPO price starts to retrace after manage to complete 178.6% Fibonacci projection figure at RM2023 region. We expect CPO price would further retrace towards support levels at RM1950 and RM1930 before making effort to search for new high in the coming trading session. Traders were advice to hold long position in the coming trading session while be cautious around resistance levels at RM2000 and RM2026 regions. KUALA LUMPUR, March 11 - Malaysian crude palm oil prices will probably drop at least 10 percent in the next 6 months as a worsening global recession reduces food and fuel consumption, senior analyst James Fry said on Wednesday. "If crude oil stays at these kinds of levels, just below $45, I would see a fall of over 10 percent," Fry told Reuters on the sidelines of an industry seminar. "If crude oil goes down, then the price will fall more." Bursa Malaysia palm oil futures edged lower on Wednesday, with the benchmark May contract down 2 ringgit to 1,993 ringgit per tonne. KUALA LUMPUR, March 11 (Reuters) - Imports of palm oil by Bangladesh will grow at only half their average annual pace of 10 percent this year as the global economic downturn saps some demand, leading Singapore traders said on Wednesday. One trader said purchases from the South Asian country would rise only 5 percent to 1.26 million tonnes of mostly crude palm olein, which is sourced mainly from Malaysia. "Bangladesh bought 1.2 million tonnes last year which is equal to a growth of 10 percent," said the trader, who mostly deals with Bangladesh and Indian palm oil imports. "This year, it will be slower, at best 5 percent higher, or in the worst case scenario, unchanged, because it's still cheaper than soyoil, although the discount is narrowing somewhat." Another trader said Bangladesh was looking to buy about 300,000 tonnes of crude palm olein for March to May shipment from both Malaysia and Indonesia, the top producers of the vegetable oil. March 10 (Bloomberg) -- OPEC, supplier of about 40 percent of the world’s oil, needs full compliance with production quotas before discussing a further reduction in output, Qatar’s oil minister said. The Organization of Petroleum Exporting Countries is set to examine at a March 15 meeting in Vienna whether members have complied with a December decision to lower output and look at estimates for future crude demand. Saudi Arabia wants OPEC to adhere to its existing output ceiling and opposes a further production cut, al-Hayat reported, citing an unidentified person commenting on the Vienna meeting. Attiyah’s comments and the Saudi Arabian position cast doubts on expectations that OPEC members will agree to a production cut at the upcoming meeting. OPEC will limit exports again when the group meets in Vienna, according to a survey by Bloomberg News. As the first simultaneous recession for six decades in the U.S., Japan and Europe slowed demand for oil, OPEC agreed to cut production in September by 500,000 barrels a day. This was followed by a 1.5 million-barrel-a-day cut at an October meeting and a further decrease of 2.2 million barrels a day at its Dec. 17 meeting. Combined, those reductions will total 4.2 million barrels a day, according to OPEC. OPEC members need to reduce supply by an additional 800,000 barrels a day to be compliant with the three production cuts made since September, Abdalla el-Badri, the group’s secretary- general, told reporters in Doha yesterday. OPEC-member compliance was about 80 percent, he said. Venezuelan Oil Minister Rafael Ramirez and President Hugo Chavez have repeatedly called for the reestablishment of a price band, in which OPEC would boost or cut output to keep oil prices within a given range. While Saudi Arabia, the world’s largest exporter, has yet to express a view, King Abdullah and Oil Minister Ali al-Naimi said last year that $75 is a fair price for producers and consumers. The group won’t set a price target and “we won’t even think about another price band,” Qatar’s al-Attiyah said. Oil prices surged fivefold in five years before peaking at $147.27 in July. In the same period, OPEC output rose 23 percent to a record 32.775 million barrels a day. As the sub-prime crisis spread, freezing credit, prices collapsed 78 percent to a low of $32.40 in December. Oil for April delivery fell as much as 43 cents, or 0.9 percent, to $46.64 a barrel in electronic trading on the New York Mercantile Exchange today. The contract traded at $46.77 a barrel at 9:49 a.m. London time. The 11 members with quotas were producing at a rate of 25.39 million barrels a day in February, according to Bloomberg estimates. Their target is to produce 24.845 million barrels a day. Iraq is allowed to produce at will. March 10 (Bloomberg) -- The U.S. reduced its forecast for 2009 global crude oil consumption for the sixth month in a row as the economic slowdown cuts fuel purchases. World oil demand will average 84.27 million barrels a day this year, down 400,030 barrels from a forecast in February, the Energy Department said in its monthly Short-Term Energy Outlook. The estimate is down 1.38 million barrels from demand in 2008, according to the report, released today in Washington. Global consumption will increase 880,000 barrels a day to an average 85.15 million barrels in 2010, according to the report. That’s down 770,000 barrels from last month’s forecast. U.S. oil demand will average 19 million barrels a day in 2009, down 420,000 barrels a day from 2008. The forecast was reduced by 20,000 barrels from last month’s report. West Texas Intermediate crude oil, the U.S. benchmark, will average $42.06 a barrel in 2009, down from $43.14 estimated in February, the report from the department’s Energy Information Administration showed. Oil averaged $99.57 a barrel in 2008, according to the report. Regular gasoline at the pump, averaged nationwide, will cost $1.96 a gallon this year, up from $1.95 estimated in the February report. The average price last year was $3.26. The fuel will average $2.18 a gallon next year. March 11 (Bloomberg) -- Crude oil was little changed in New York, after declining 2.9 percent yesterday, amid speculation a government report later today will show U.S. inventories gained as demand weakened. The Energy Department may say that supplies rose 250,000 barrels last week, according to the median of 14 analyst responses in a Bloomberg News survey. World oil consumption will average 84.27 million barrels a day this year, down 1.38 million barrels from 2008, the department reported yesterday. Crude oil for April delivery fell 5 cents, or 0.1 percent, to $45.66 a barrel at 10:00 a.m. Sydney time on the New York Mercantile Exchange. Yesterday, futures fell $1.36 to settle at $45.71 a barrel. Prices are up 2.5 percent so far this year. An inventory gain today would be the 20th in 24 weeks. The Energy Department will release its weekly report at 10:30 a.m. in Washington. The industry-funded American Petroleum Institute said supplies fell 419,000 barrels to 345.3 million barrels last week, in a report released yesterday in Washington after the close of trading. The Organization of Petroleum Exporting Countries has reduced output three times since September. Ministers meet in Vienna on March 15. OPEC must comply fully with existing reduction agreements before making new ones, Qatar’s oil minister said. Saudi Arabia wants OPEC to comply with its output ceiling and opposes a further curtailment in production, al-Hayat newspaper reported, citing an unidentified person. The 11 OPEC members with quotas, all except Iraq, produced 25.39 million barrels a day in February, down from 29.22 million barrels a day in September, according to a Bloomberg News survey of oil companies, producers and analysts. The group agreed to pump 24.845 million barrels a day starting Jan. 1. Saudi Arabia, Kuwait, Qatar and the United Arab Emirates are producing less than their targets. Oil markets remain “weak” because of the worsening global economy, and OPEC is concerned about the implications for future investment, Jose Maria Botelho de Vasconcelos, the group’s president, said in a statement issued in Luanda, Angola, yesterday. “The deep impact of the economic turmoil on the world oil market is evident with its continuing contraction, and it pressures the market with high oil stocks despite OPEC measures,” de Vasconcelos said. Oil prices in New York have dropped 69 percent from a record $147.27 on July 11 as the U.S., Europe and Japan face a simultaneous recession that’s cut fuel demand. The U.S. jobless rate will reach 9.4 percent this year and remain elevated through at least 2011, threatening the nation’s longer-term growth potential, a Bloomberg News survey of economists indicated. Gasoline stockpiles probably dropped 1 million barrels in the week ended March 6 from 215.5 million the week before, according to the Bloomberg News survey. Supplies of distillate fuel, a category that includes heating oil and diesel, probably rose 200,000 barrels. Gasoline futures for April delivery declined 3.79 cents, or 2.8 percent, to end the session at $1.2972 a gallon in New York. Heating oil for April delivery fell 1.67 cents, or 1.4 percent, to settle at $1.1987. The average U.S. pump price for regular gasoline dropped 0.4 cent to $1.941 a gallon yesterday, AAA, the nation’s largest motorist organization, said on its Web site. Prices have declined 53 percent from the record $4.114 a gallon reached in July. March 11 (Bloomberg) -- The dollar may extend declines against most major currencies after global stocks rallied as Citigroup Inc. said this quarter may be its best since 2007, reducing the greenback’s appeal as a refuge. The yen may fall for a fourth day against the euro after a report showed machinery orders in Japan dropped for a fourth month in January, the longest streak of declines on record. The Australian dollar gained to the strongest in a week as U.S. stocks posted their biggest rally this year, raising speculation investors will buy riskier assets. “An easing of the credit tightness is positive for higher- yielding currencies and negative for the dollar,” said Osamu Takashima, chief foreign-exchange analyst at Bank of Tokyo- Mitsubishi UFJ Ltd., a unit of Japan’s biggest financial group. The dollar may be sold toward $1.30 against the euro, he said. The dollar traded at $1.2714 per euro at 9 a.m. in Tokyo from $1.2682 late in New York yesterday. Europe’s currency was at 125.62 yen from 125.13 yen. The dollar was at 98.80 yen from 98.67 yen. Foreign-exchange volatility, a measure of risk implied by option prices, was close to a four-month low, a JPMorgan Chase & Co. index shows. Options traders see currencies of the Group of Seven industrialized nations fluctuating by an annualized 17 percent in the next three months, compared with 27 percent on Oct. 24, which had been the most since the index started in 1992. Australia’s currency rose to 64.75 U.S. cents from 64.59 cents. It touched 64.88 cents, the most since March 5. New Zealand’s dollar advanced to 50.53 U.S. cents from 50.33 cents late in New York. The Dollar Index, which the ICE uses to track the greenback’s performance against the currencies of six major U.S. trading partners, fell 0.4 percent to 88.688 yesterday after stock gains eroded the demand for safety. The index touched 89.624 on March 4, the highest level since April 2006. The Standard & Poor’s 500 Index rallied 6.4 percent as Citigroup Chief Executive Officer Vikram Pandit said in a memo obtained by Bloomberg News that the bank’s current share price doesn’t reflect its earnings potential or capital position. The MSCI World Index rose 5 percent. Japanese machinery orders slumped 3.2 percent in January from the previous month, a smaller decline than the median forecast for a 4.8 percent drop in a Bloomberg survey. The report added to evidence the world’s second-largest economy is sinking deeper into recession. A separate government report tomorrow will show Japan’s real gross domestic product fell 13.4 percent in the final quarter of 2008, according to a Bloomberg survey. The Cabinet Office will release the revised GDP data tomorrow. The government on Feb. 16 estimated that gross domestic product fell at an annual rate of 12.7 percent in the three months to December, the fastest since the 1974 oil shock, as exports collapsed. Sterling may extend declines against the euro because the Bank of England’s plan to buy gilts to support the economy will probably narrow the yield advantage of U.K. government bonds over German counterparts, Bank of Tokyo-Mitsubishi said in a research note yesterday. The difference between yields on 10- year gilts and comparable German notes shrank yesterday to 0.11 percentage point from 0.19 percentage point on March 9. The euro may gain after European Central Bank council member Axel Weber said in Frankfurt that “the bottom line” for the main rate should be 1 percent. The central bank cut the target to a record 1.5 percent on March 5. FCPO 3rd month May Futures contract rose RM61 higher to close at RM1995 as compare to previous trading session with 6749 lots traded in the market. CPO price was maintain at higher price during the trading session as soybean oil and crude oil electronic continue to surge higher despite of strong overnight closing. Technically, CPO price seems encounter strong selling pressure around 161.8% Fibonacci projection figure at RM2009 regions after been traded higher for 4 consecutive days. We expect CPO price would retrace mildly towards support levels RM1970 and RM1923 regions. Traders were advice to hold long position in the coming trading session while be alert around resistance levels at RM2027 and RM2050 region. FKLI March futures contract marginally 2 point lower to close at 861 as compare to previous trading session with total 7225 lots traded in the market. FKLI was traded wild during trading session due to mini budget announce by our Finance Minister despite Dow Jones futures electronic trading was traded lower during morning trading session. 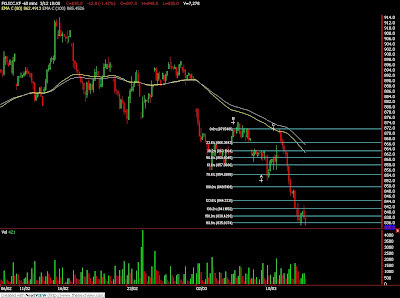 Technically, FKLI seems rebound 61.8% at 865 levels after complete target 78.6% Fibonacci projection at 852 regions. 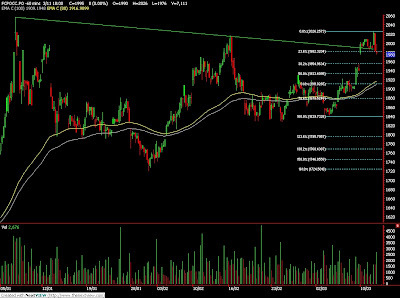 We expect FKLI would trade lower in the coming trading provided resistance levels at 868 and 874 were not violated. 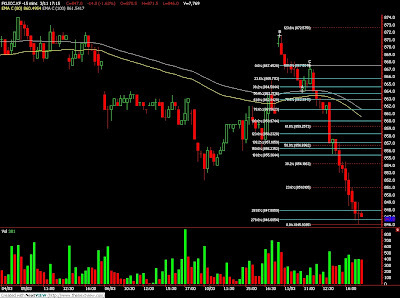 Traders were advice to hold short position in the coming trading session while be cautious around support levels at 856 and 852. KUALA LUMPUR, March 10 (Reuters) - India, the world's second biggest vegetable oil importer, will slow purchases of palm and soyoil as its import inventories have doubled to 500,000 tonnes now from three months ago, a top analyst said on Tuesday. Dorab Mistry, head of vegetable oils trading at Indian conglomerate Godrej International, said overall vegetable oil stockpiles in the South Asian nation would rise by the end of 2008/2009 in Oct to 1.2 million tonnes from 1 million now. Stocks at 1.2 million tonnes are sufficient for a full month of consumption, Mistry said, a significant figure as India's stockpiles have traditionally been very low. India does not publish statistics on vegetable oil inventories. "Buying has been strong for the past few months because, by and large, prices of palm oil have been attractive and also the fear of import duties coming in later on in the year," Mistry told Reuters in an interview ahead of a key palm oil conference in the Malaysian capital. "In March the strength of the imports will slow because we have the incoming rapeseed crop. I believe it will be 6.4 million tonnes from 4 to 4.5 million tonnes last year, which is significantly better." India grows two oilseed crops, mainly soybean and groundnut in winter, and rapeseed and groundnut in the summer. The rapeseed crop is much higher this year due to its larger acreage, traders have said. India imports roughly half of the 11 million tonnes of vegetable oils it consumes annually. It buys refined palm oil from Malaysia and crude palm oil from Indonesia as well as soyoil from Brazil and Argentina. On China's moves to spend an extra $10 billion to bulk up its commodity reserves by buying excess supplies of resources and imports of the edible oils, grains and materials it does not have, Mistry said the impact on palm oil markets would be minimal. March 10 (Bloomberg) -- Crude oil climbed for a third day in New York after Saudi Arabia told Asian refiners that it will reduce supplies next month and on speculation that OPEC output cuts led to a decline in U.S. inventories. Saudi Aramco, the world’s biggest state oil company, will reduce shipments to Japan in April for a fifth month, said officials at three refineries who received notices. U.S. crude- oil supplies probably fell 500,000 barrels last week, according to the median of analysts estimates before an Energy Department report this week. Crude oil for April delivery rose as much as 37 cents, or 0.8 percent, to $47.44 a barrel in electronic trading on the New York Mercantile Exchange. It was at $47.30 a barrel at 9:56 a.m. Singapore time. Prices, up 6.1 percent this year, have tumbled 68 percent from a record in July. Yesterday, futures rose $1.55, or 3.4 percent, to close at $47.07 a barrel, the highest settlement since Jan. 6. The Organization of Petroleum Exporting Countries has cut production targets three times since September to combat price declines and prevent a glut on world markets. There is speculation the group will decide to reduce output when ministers gather in Vienna on March 15. Oil will rise above $50 a barrel in the third quarter if OPEC cuts production by 1 million barrels a day at its March 15 meeting, Kuwaiti state news agency KUNA reported, citing Mussa Maarafi, a member of the country’s Supreme Petroleum Council. Saudi Arabia wants OPEC to comply with its existing output ceiling and opposes a further production cut, al-Hayat newspaper reported, citing an unidentified person. Brent crude oil for April settlement rose as much as 27 cents, or 0.6 percent, to $44.40 a barrel on London’s ICE Futures Europe exchange. It was at $44.36 a barrel at 9:24 a.m. Singapore time. The contract declined 72 cents, or 1.6 percent, to $44.13 a barrel yesterday. Oil in New York traded at a premium of $2.94 a barrel to the Brent grade yesterday, the widest spread since Nov. 13. The premium of Brent to West Texas Intermediate, the grade traded in New York, disappeared after a weekly Energy Department report on March 4 showed a third straight drop in stockpiles in Cushing, Oklahoma, the delivery point for New York futures. Rising inventories at Cushing had pushed WTI prices to record discounts to Brent crude. The price of oil on the Nymex for delivery in May is more than 80 cents a barrel higher than for April, down from a 99 cent premium yesterday and a $2.20 premium on March 6. This structure, in which the future month’s price is higher than the one before it, is known as contango and allows buyers to profit from hoarding oil. March 10 (Bloomberg) -- Crude oil climbed for a third day in New York on speculation the Organization of Petroleum Exporting Countries will decide to reduce output when ministers gather in Vienna on March 15. The “dramatic drop” in oil prices has been greater than warranted by the decline in global demand, Venezuelan Finance Minister Ali Rodriguez said March 8. OPEC must remove 800,000 barrels a day to meet its commitment to reduce output by 4.2 million barrels since September, Secretary General Abdalla el- Badri said in Qatar yesterday. Crude oil for April delivery rose 20 cents, or 0.4 percent, to $47.27 a barrel at 10:09 a.m. Sydney time on the New York Mercantile Exchange. Prices, up 5.5 percent this year, have tumbled 68 percent from a record in July. Yesterday, futures rose $1.55, or 3.4 percent, to settle at $47.07 a barrel. It was the highest settlement since Jan. 6. OPEC has cut production targets three times since September to combat price declines and prevent a glut on world markets. The global economy is likely to shrink for the first time since World War II, and trade will decline by the most in 80 years, the World Bank said. The Washington-based bank didn’t provide a specific estimate in a report earlier this week. Brent crude oil for April settlement declined 72 cents, or 1.6 percent, to end the session at $44.13 a barrel on London’s ICE Futures Europe exchange. Oil in New York traded at a premium of $2.94 a barrel to the Brent grade yesterday, the widest spread since Nov. 13. A premium of Brent to West Texas Intermediate, the grade traded in New York, disappeared after a weekly Energy Department report on March 4 showed a third straight drop in stockpiles in Cushing, Oklahoma, the delivery point for New York futures. Rising inventories at Cushing had pushed WTI prices to record discounts to Brent crude. The price of oil on the Nymex for delivery in May is 95 cents a barrel higher than for April, down from a 99 cent premium yesterday and a $2.20 premium on March 6. An Energy Department report due tomorrow will probably show that U.S. stockpiles of crude oil fell 500,000 barrels last week, according to the median of nine analyst responses to a Bloomberg News survey. Gasoline stockpiles dropped 1 million barrels, according to the survey. March 9 (Bloomberg) -- Gold futures fell as some investors sold the precious metal following a two-session rally. Silver also declined. Investment demand in the SPDR Gold Trust, the biggest exchange-traded fund backed by bullion, stalled after reaching a record 1,029.3 metric tons on Feb. 26. Gold rose 4 percent in the previous two sessions in New York after declining for eight straight days. On Feb. 20, the metal topped $1,000 an ounce for the first time in 11 months. Gold futures for April delivery fell $24.70, or 2.6 percent, to $918 on the New York Mercantile Exchange’s Comex division. The price rose 20 cents last week. Silver futures for May delivery fell 39.3 cents, or 2.9 percent, to $12.94 an ounce on Comex. The price gained 1.7 percent last week. Most-active gold futures still are up 3.8 percent this year, while silver futures have risen 15 percent. Investment in the SPDR Gold Trust fell to 1,028.99 tons on March 6. Investment in the ETF is up 32 percent this year. The Standard & Poor’s 500 Index rose as much as 1.7 percent before erasing gains. Gold also fell as the dollar strengthened. The U.S. Dollar Index, a gauge that includes the euro and yen, gained as much as 1.1 percent. The precious metal and the U.S. currency generally move in the opposite direction. The correlation hasn’t held this year as investors bought both assets as havens against deterioration in other financial markets. “As long as we had inflows into the ETFs, gold traders didn’t care about dollar strength,” Lesh said. Still, gold’s losses may be limited as investors seek a store of value as equity markets struggle. Major stock indexes in the U.S. and Europe have declined for four straight weeks. The U.S. economy “has fallen off a cliff” and the government’s effort to revive growth is “potentially very inflationary,” billionaire Warren Buffett said today in a CNBC television appearance. He said inflation could exceed rates last reached in the 1970s. “Further weakness and volatility in global stock markets sparked by disappointment in the political landscape and worries about insurance companies should also boost gold prices, as traders migrate toward investments that are not only less volatile, but also are seen as holding their value,” said Tom Pawlicki, an analyst at MF Global Ltd. in Chicago. Gold and oil will be the best-performing commodities this year, according to a survey of investors by Barclays Capital. March 10 (Bloomberg) -- The yen may fall for a third day against the dollar before a government report that analysts say will show Japan’s economy is deteriorating because of the global recession, reducing the appeal of the country’s currency. Britain’s pound slipped below $1.38 yesterday for the first time since January after the government took a majority stake in Lloyds Banking Group Plc, the biggest U.K. mortgage lender. The euro may weaken for a second day versus the dollar after European finance ministers resisted calls for more aid to boost their economies. The yen traded at 99.02 against the dollar as of 8:33 a.m. in Tokyo from 98.84 late in New York yesterday. Japan’s currency was at 124.77 per euro from 124.65. The euro traded at $1.2601 from $1.2611. Japan’s composite leading index of business conditions, an indicator of future economic activity, fell to 77.4 in January from 80 in December, according to economists surveyed by Bloomberg News. The coincident index, which shows current economic activity, fell to 89.8 from 92.4, according to a separate Bloomberg survey. The Cabinet Office will release both reports at 2 p.m. in Tokyo. Machinery orders slumped 40.2 percent in January from a year earlier, according to another Bloomberg survey before a Cabinet Office report tomorrow. The world’s second-biggest economy shrank an annualized 12.7 percent last quarter, the government said Feb. 16, the biggest contraction since 1974. The Dollar Index, which the ICE uses to track the greenback’s performance against the currencies of six major U.S. trading partners, rose 0.6 percent to 89.009 yesterday. The index touched 89.624 last week, the highest level since April 2006. The Standard & Poor’s 500 index dropped 1 percent yesterday, while the Dow Jones Stoxx 600 of European equities lost 1 percent. The pound fell yesterday against all of the 16 most actively traded currencies tracked by Bloomberg after Lloyds Banking Group ceded control to the government in return for state guarantees covering 260 billion pounds ($367 billion) of risky assets. Sterling lost as much as 2.5 percent to $1.3743, the lowest level since Jan. 26, and declined 1.8 percent to 91.47 pence against the euro. The euro may extend losses against the dollar as European finance ministers resist doing more to boost their economies even as the World Bank forecasts the biggest global recession since World War II. “We take the view that we don’t need to make a further effort,” Luxembourg Finance Minister Jean-Claude Juncker told reporters after leading a meeting of euro-area finance chiefs in Brussels yesterday. Germany’s Peer Steinbrueck said his government is “not discussing any additional measures” to boost Europe’s largest economy. European Central Bank President Jean-Claude Trichet said at a press conference in Basel, Switzerland, that the world may be approaching a turning point and that measures taken by central banks and governments should stimulate economic growth. “This is a cue to sell the euro because it tells the market you might be underestimating the severity of the situation and already the ECB is thought to be slightly behind the curve,” said Sebastien Galy, a currency strategist at BNP Paribas Securities SA in New York. The ECB is probably “hoping for the euro to go lower because it allows them to not have to cut rates so much,” he said. The ECB reduced its main refinancing rate last week to 1.5 percent, the lowest level since the made its debut in 1999. The Federal Reserve’s target is in a range of zero to 0.25 percent. FKLI March futures contract fall 5 lower to close at 863 as compare to previous trading session with total 6080 lots traded in the market. FKLI was traded throughout the entire trading session as confusing news such as stimulus package is contradicting with regional indices performance. 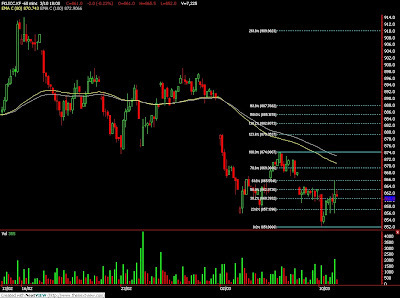 Technically, FKLI seems trading sideways within range from 860 to 863.5 regions during the trading session. FKLI seems temporary supported above 23.6% projection levels at 860 regions. However, we expect FKLI would trade lower in the coming trading session provided resistances levels at 899 and 905 were not violated. 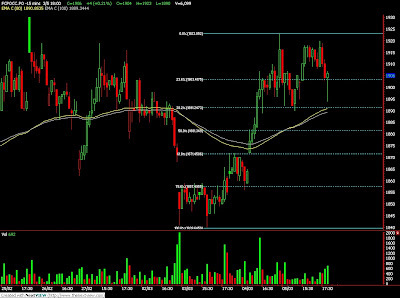 Traders were advice to hold short position in the coming trading session while support seen at 858 and 845 regions. FCPO 3rd month May Futures contract rose RM34 higher to close at RM1940 as compare to previous trading session with 6954 lots traded in the market. CPO price was traded higher in the coming trading session as soybean oil and crude oil electronic trading were surge higher during trading session. Technically, CPO price manage to surge higher after break the resistance trend line at RM1920 level and manage to penetrate 80 – days and 100 – day moving average in the hourly price chart. We expect CPO price will traded higher in the coming trading session provided support levels at RM1830 and RM1890 were not violated. Traders were advice to hold long position in the coming trading session while be cautious around resistance levels at RM1970 and RM2000 regions.